Arecibo is a municipality on the northern coast of Puerto Rico (U.S.), on the shores of the Atlantic Ocean, located north of Utuado and Ciales; east of Hatillo; and west of Barceloneta and Florida. It is about west of San Juan, the capital city. Arecibo is the largest municipality in Puerto Rico by area, and is part of the San Juan, Caguas and Guaynabo Metropolitan Statistical Area. It is spread over 18 wards and Arecibo Pueblo (the downtown area and the administrative center of the city). Its population in 2010 was 96,440.Arecibo is also known as La Villa del Capitán Correa (Captain Correa's Villa) after the Puerto Rican hero Captain Antonio de los Reyes Correa of the Spanish Army, who drove off a British Navy invasion by ambushing forces led by rear-admiral William Whetstone. Arecibo is also known as El Diamante Del Norte (The Diamond of the North) and La Ribera del Arecibo (The shore of Arecibo).The Arecibo Observatory, until July 2016 the world's largest radio telescope, is located here. Arecibo is the seat of the Roman Catholic Diocese of Arecibo. Arecibo is in Puerto Rico. 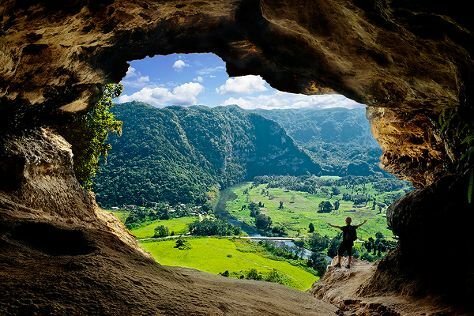 Use our international travel planner: Arecibo and all its delights await.